2. Select Destination Page – Select from the drop down menu the page the reader should be taken to once they select the TOC item. A preview of the page selected will be shown. 3. Add – Click ‘add’ to include the item in the Table of Contents on the app. 4. Info Area – Here you will see the image of the page you selected, the title given to the TOC item, and the page number destination. 5. Edit – Click on the edit tool to change the title or the destination page once saved. 6. Delete – Click on the X to delete the item from the TOC list. * Please note that the TOC will be shown before download as a promotional tool, but will be inactive. 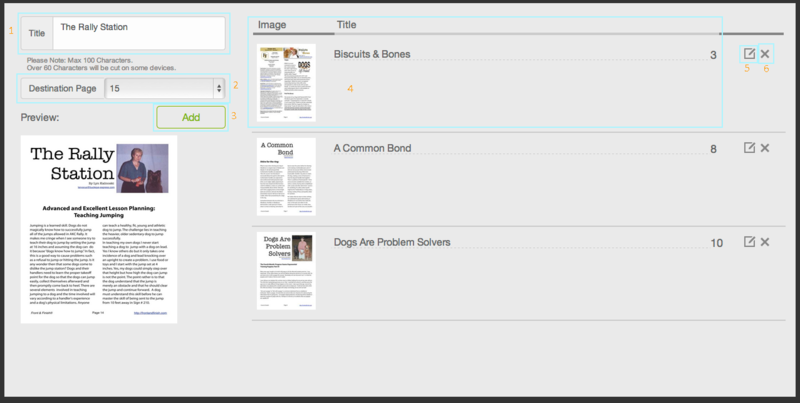 Once the user downloads the publication they will have a TOC icon on the top left which they can use at any time to navigate in the PDF.